Fiat has handed over the first collection of 500 Prima Ediziones to keen consumers, following a 27 year absence. 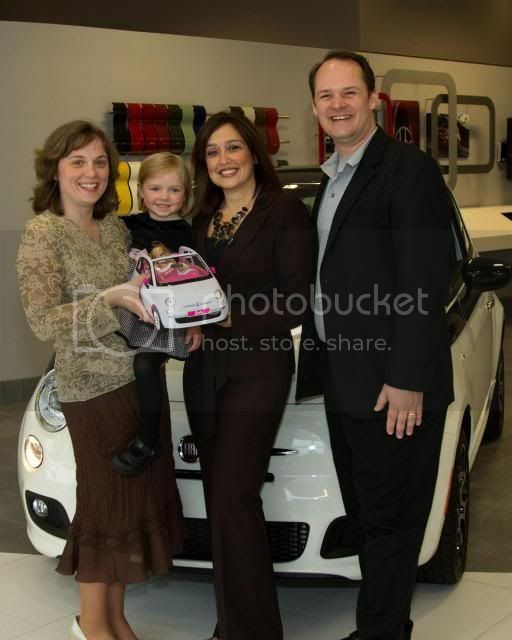 Executive of Fiat North America, Laura Soave said in a statement: "We are delighted to begin delivering the highly-anticipated Fiat Cinquecento Prima Edizione models to our cherished Fiat fans. The Prima Edizione marks the exciting and long-awaited return of the Fiat brand and true Italian automotive design to North America." The Prima Edizione (First Edition) model is meant for Fiat stalwarts like Shaun Folkerts, 38, who has a barn full of Fiat vehicles, dating back to 1958 and in various stages of restoration on his property in Douglassville, Pa. He has 90 Fiat vehicles in his collection, about a third of them housed in the barn, and the rest in a nearby warehouse. 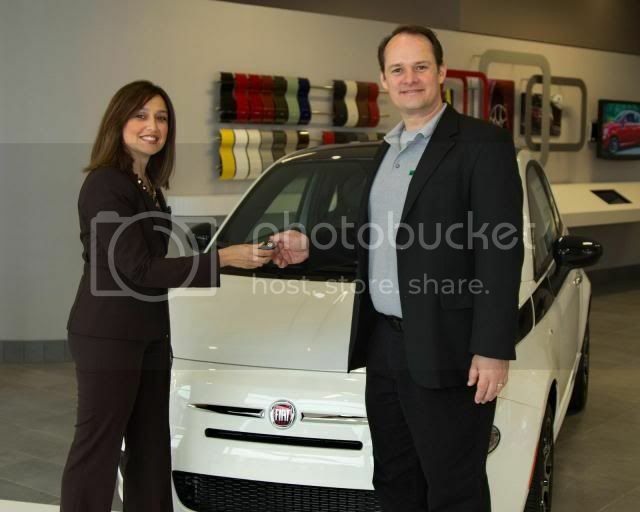 Folkerts, a former environmental consultant and now stay-at-home dad, drove today from his home in southeastern Pennsylvania to take delivery of his Prima Edizione at Fiat of Gaithersburg, a Fiat Studio in Maryland in the metro Washington D.C. Area. "I've been waiting almost 28 years for this model to arrive, so I would drive anywhere, anytime for this Fiat 500," an elated Folkerts said. 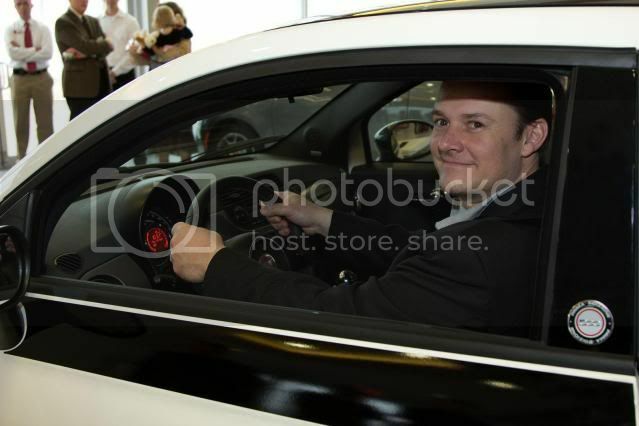 Folkerts' first car as a teenager was a Fiat Spider "and I've never looked back." In July 2010, Fiat fans attending the Club Fiat-Lancia Unlimited annual convention in North Carolina were given the opportunity to place reservations and select their vehicle build number for the unique Prima Edizione model. Folkerts took delivery today of Prima Edizione No. 11, produced in Toluca, Mexico. The model appeals to a broad spectrum of customers, like the father and son from Pennsylvania, each getting their own Prima Edizione model, and the husband and wife team of Italian descent in Philadelphia who will soon take delivery of a Rosso (Red) Prima Edizione and a Bianco (White) model. Even a 16-year-old high school sophomore soon will drive her Prima Edizione model home in suburban Detroit. "The fact that these cars are reserved by a father and son, a husband and wife, and even a high school girl illustrates the strong appeal of this model to a broad array of customers who identify with Italian design, modern technology, fuel efficiency and overall value," Soave said. The same engine powering the regular 500 will be available, alongside the same transmissions.